If you need help with estate planning, probate issues, or any elder law matters in Charlotte Hall, Maryland, the legal team at SinclairProsser Law can provide the assistance that you need. Our firm is a full-service firm that provides assistance to people of all ages. We offer a wide range of services related to incapacity planning, Medicaid planning, legacy planning, estate planning, estate administration and more. Our goal is to give you the tools you need to grow your assets, protect your wealth, address end-of-life issues, and provide for your family now and in the future. You should have plans in place at all stages of your life to determine what happens to you, your property, and your family in case of sickness, injury, or your untimely death. SinclairProsser Law can help with making your plans so you have the peace of mind of knowing that you’re prepared for whatever the future brings. If you live in or around Charlotte Hall, Maryland, give us a call today to find out more. Charlotte Hall is classified as a census-designated place (CDP). It is located within two different counties in Maryland: Charles County and St. Mary’s County. As of the most recent census which measured the population in the Charlotte Hall area, there were just over 1,200 people living locally. Charlotte Hall is perhaps best known for being the location of the Maryland Veterans’ Home for Disabled Veterans. The Home for Disabled Veterans, along with a VA clinic, are both located on the site which was formally the Charlotte Hall Military Academy. This Academy has been listed on the National Registrar of Historic Places and has been since 1975. The location of the former Charlotte Hall Military Academy has also been declared as part of the Charlotte Hall Historic District. Charlotte Hall has more than just a VA clinic. There is also a large Amish farming community living in and around the area where the clinic is located. There are numerous strip malls, a large complex with a market, and a farmer’s market providing services to locals and visitors. As of the most recent census, 6.9 percent of households in Charlotte Hall, MD were comprised of someone over the age of 65 who was living independently. Seniors within Maryland should maintain strong ties to the community when possible to enhance quality of life and should explore opportunities to take advantage of benefits and programs intended for seniors. For example, there is a Northern Senior Activity Center that is located to the north of the Charlotte Hall Veterans Home at 29655 Charlotte Hall Road, Charlotte Hall, MD 20622. The senior center has a pottery studio for doing ceramics, fitness equipment, social activities, a library, a terra trike bicycle that can be used free on Three Notch trails, a game room, a theater, an arts and crafts room, an outdoor patio, and space for private tutoring on computer use. Seniors can visit this facility and take part in many programs that enrich their lives. For those seniors who need help exploring other benefits that could be available to them – including coverage for long-term care costs – SinclairProsser Law can help. Avoiding probate is one service SinclairProsser Law helps to provide to seniors. Probate is time-consuming and it can cost a substantial amount of money, so transferring assets outside the probate process is often preferred. An estate plan that incorporates tools like trusts, joint ownership and pay-on-death accounts can make avoiding probate possible. If no steps have been taken to avoid probate and a loved one has passed away, the estate generally must be probated. In Maryland, the Office of the Registrar of the Wills serves as the clerk to the Orphan’s Court, which is the court where probate proceedings takes place. The Office of the Registrar of Wills helps with filing paperwork for court proceedings and appoints personal representatives to administer the estates of decedents when appropriate. There is an Office of the Registrar of Wills located within each county. Because Charlotte Hall is located in two counties, Charles County and St. Mary’s County, it is necessary to know which county the decedent lived in to determine which Registrar of Wills will process paperwork and which Orphan’s Court would need to initiate probate proceedings. In Charles County, the Office of the Registrar of Wills is located in La Plata, Maryland. In St. Mary’s County, the Office of the Registrar of Wills is located in Leonardtown, Maryland. If you must become involved in a probate court matter for any reason, it is to your benefit to work with an experienced attorney who can guide you through the process of filing paperwork with the Office of the Registrar of Wills and who can help you through all of the other steps in the estate administration process. SinclairProsser Law offers representation to executors or personal representatives who are in charge of overseeing the probate process. They also work with the successor trustee in the estate administration process. 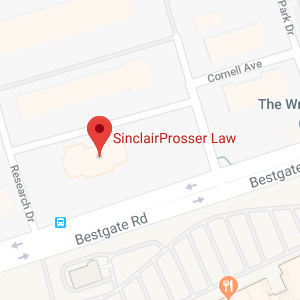 If you live in Charlotte Hall, MD and you need help with estate planning or elder law matters, SinclairProsser Law can provide the representation and advocacy you are looking for. Give us a call at 410-573-4818, 301-970-8080 or contact us online to schedule a consultation with a qualified estate planning or elder law attorney. Qu q qualified estate planning attorney.r legal team can help you.